Depending on your viewpoint, the RDX Quikstor is one of two things. It's either a cartidge-based backup system designed to replace tape for off-site office backups, or it's a cunning way to use plastic packaging to sell standard kit for extra money. The cartridges, you see, are just mobile hard drives in clever packaging – definitely a lot more convenient than tape backup, but with the best price for a 300GB cartridge standing at around £250 from Dabs.com, that packaging is starting to look pricey. Search around and you'll be able to find an equivalent mobile drive, sans natty plastic box, for £60-£70, and tapes cost about the same amount. Ouch. Windows users get a host of tools for the financial outlay; us Mac users, so far, aren't as happily catered for. The Quikstor just appears as an external drive, enabling you to make use of the perfectly adequate Time Machine for backups. So really, particularly in this external USB 2.0 guise, this is just a fancy external drive. Even at the enterprise level, it's hard to justify paying so much for what ends up being bog-standard storage. It's not alone in the cartridge-based backup market, either. Unquestionably, the removable platter format of Iomega's REV drive is superior to the Quikstor's standard mobile hard drive in terms of shock protection, and REV disks are smaller and slightly better value. 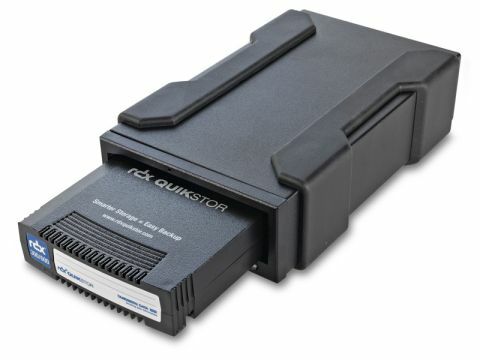 But the chunky Quickstor cartridges can stand a knock or two, and if they didn't use standard (read: flimsy) SATA rear connectors we'd be even more convinced of their long-term ruggedness. Tandberg Data reckons they'll last a good 10 years or 5,000 insertions. We'll go with that. If we were looking at this in its internal guise, which eliminates the USB bottleneck, we might feel differently about the system. This is probably the best cartridge-based backup solution out there, but you probably already know if you're going to find it useful. Chances are you won't.